Slovenian (Steirische) button accordion - how to start? 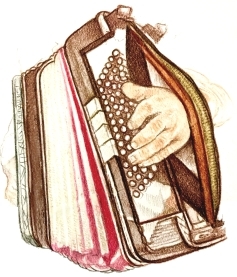 This is a list of resources I've compiled for learning and finding a Slovenian or Austrian diatonic button accordion, targeted to those who live outside of central Europe, where it can be difficult to find the resources and assistance to get started with it. I've been asked a few times for help on how to get started, what instrument to get and where to buy one, so I hope this can assist others wanting to take up this instrument. Like any other accordion, the left side (if you were holding it) is the bass (harmony/accompaniment), and the right side is the treble (melody). 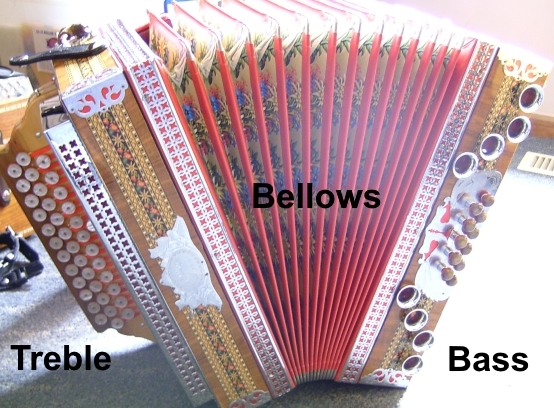 These accordions are bisonoric, meaning that each button on the accordion produces a different note depending on the direction of the bellows' movement (push or pull). Helikon bases are the deep sounding bases unique to this type of accordion. The bases are typically constrained to the tuning of the box, and only allow major chords (bright tunes only, as is the style of music). Almost all of these accordions have decorative horns on the bass side but have no relevance to the sound at all. In Slovenia and Austria, musical notes are referred to by the German alphabetic system. Names of the tunings for the accordions follow the German system. While there are other ordinary diatonic button accordions around, and easier to find, they don't have the same keyboard and bass button layout as the Slovenian accordion or steirische (not to mention the unique sound and aesthetic). So you would need to look for an actual Slovenian or Austrian diatonic button accordion. In Slovenia, these accordions are called frajtonarca or diatonična harmonika. They normally have 3 rows on the treble side, which means you can play songs in the 3 keys you're given. For example on a CFB box, you are limited to playing songs in the keys of C, F and Bb. But that's never an issue, as songs are normally written within the constraints of 3 keys. They come in 4 to 5 row variations as well, however that's much more common in Austria. The most common keys in Slovenia seem to be CFB and BEsAs. I used to own a less common ADG but found it too low for chirpy Slovenian songs. I won't list brand names as there's so many of them around today and are still actively produced by both small and large companies. Nowadays, some brands assemble accordions themselves, and others contract Italian producers. In Austria they are known as steirische harmonika and are also manufactured in Austria. They are the same as Slovenian, but are typically found in 4 or 5 row variations, often tuned just a little differently (wetter or drier), but they have the same music style, sound and appearance. Austria too has so many active brands, however to my knowledge there are more brands that produce their own rather than outsource to Italy. Visit a local Slovenian, Austrian (may be worth trying German as well) social club, and ask around for someone who may have a button accordion for sale, or someone who may play one. From here you may be able to find one second hand and not so expensive. Talk to your local accordion dealer if you're lucky enough to have one! They might know someone to order from, or even have one in stock. Look at local online trading sites like Gumtree, eBay, etc. Use search terms like slovenian accordion, austrian accordion, diatonic button accordion, steirische. If you're not on a hurry, you can set up notification emails so that you get alerted as soon as someone starts selling one in your area (or within a radius). For beginners, there may not be lots of value in spending too much on the first accordion, as you don't know how it will pan out. You may find that you don't like it or lose enthusiasm to learn. Typically as skill and interest progresses, people turn to better accordions, but start off with a cheap box. You won't notice the difference between a basic box and a great box when you start out. If you're planning on visiting Slovenia or Austria any time soon, it may be worth checking the local Gumtree/Craigslist equivalents like bolha.com using Slovenian keywords (diatonična harmonika, frajtonerca, and rabljena which means used) or willhaben.at with keywords used in Austria (steirische harmonika, and gebrauchte which means second hand). It seems that decent used boxes start at around 800 Euro. Whereas brand new range from 2,000€ through to 6,000€ and beyond. At the time of writing this, the most promising resources I've found are listed below, with an emphasis on resources in English. I haven't used it but it sounds promising and it's been around since the 70s. It's written by Al Jevsevar from Pennsylvania, in English, catered for the Slovenian button accordion/Steirische, and doesn't require any prior ability to read sheet music. It comes in three books, starting with a beginner level one that goes through all the basics. It's available on eBay (here's the link). At the time of picking up the button accordion, I used a desktop app VSLN (Vsak se lahko nauči, translates to Anyone can learn) to get started, and it did a great job in place of a teacher. I believe it was only available in Slovenian at the time, but now there's an online version called GoterPlay and is also available in English. The person behind both is Slovenian button accordion teacher and champion Robert Goter. But he's gone further than that, and gotten a mobile app done as well. It's free and available on both iOS and Android. I'm really impressed by it. Here's a link to the Android app and iOS app. To start learning, you choose a song from a numbered level, and it will start playing it while highlighting the buttons that need to be pressed (both bass and treble), the names of their notes, and the bellows direction. It also allows you to switch between English, German and Slovenian, change the (virtual) accordion's tuning/keys to match your accordion, and the song speed, so that you can follow along at your desired pace. I believe extra songs are available through purchases. If you have a large enough device (or tiny fingers on a smaller device) you can play on the app's accordion too (see below). Here's a tutorial video by Fred Ziwich. I found that this was an easy song to start off with (this was my first song), and learning it made me familiar with the keyboard layout and common button combinations. He's not using a Slovenian style button accordion here, but the one he's using shares the same layout it seems. I'll add the disclaimer that I started button accordion after years of learning piano accordion, which probably made it easier for me to pick it up. You may find that this video might be more helpful after covering the basics, it just depends on the individual. If you're already familiar with another type of accordion, you might like the challenge of jumping into this tutorial. Slovenia and Austria both have books available with sheet music and different types of notation. Sheet music from Slovenia usually has normal music notation for accordion, with the corresponding button name above each note (eg. B3 for 3rd button from the chin on the 2nd row from the outside), as well as indicators for the bellow direction. I hope this can assist you in getting started. If you have any additional resources you'd like to share or any questions please don't hesitate to leave a comment.